The 2 squad based machine guns in WW2 used by amercians were the BAR(battlefield automatic rifle) or 30.calm1919. My question is what would you rather use? The bar had a small amount of ammo and wasnt really considered a machine gun by ww2 but it was still issued with a bipod to be used as a machine gun. The gun is known for frequent jamming and a generally slow rate of fire. It also had a small mag capacity. 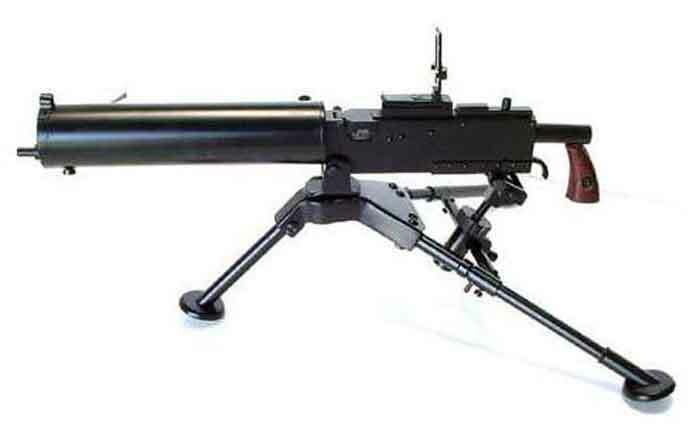 im not sure on which model was used in ww2 i belive it was the M1918A2 anyways onto the 30.cal M1919 This gun Was a belt fed machine gun with fast rate of fire. It Was issued with a bipod or tripod. It unlike the bar could not be used at closeish ranges. It also couldnt fire acuratly when the person firing was standing. Unlike the bar it could work much better in the supression role and could fire for quite some time without overheating. Pick a gun! Well the B.A.R is already done for Normandy. And I'm sure the m1919 will be in as well. Sire_Apple;4773120Well the B.A.R is already done for Normandy. Great response dude. I'd probable pick the BAR for its mobility, but the bipod version of the m1919 with the stock would be a better squad support weapon. BAR for gunner class. M1919 as a deployable kit and emplaced guns. Maybe a Stinger when we get to the pacific. It was a field modification, and not common enough to be a class gun. It depends on what you want it for, I guess. Isn't it Browning Automatic Rifle? Yes your right it was browning automatic rifle. I cant remember were i heard it was battlefield. Anyways. The thing im concerned about is that usally 1 browning was issued to a squad and 2 bars. if bf2 that would be over load but i think maybe some maps would have the 30.cal and some the BAR its only fair the germans get a machine gun that can rip apart squads why cant the allies? The m1919 with the stock is the M1919A6. It was created to replace the BAR and is first appearance was during the battle of bulge. The m1919A6 can be a great second choice for the support class, but certainly not in normandy. I am pretty certain the M1919A4 .30 caliber machine gun was issued on the platoon level during World War II. (I think each platoon had a MG section with two such weapons) However the issue of the later M1919A6 may have been different. The M1919A6 was produced in smaller numbers and was supposed to be something of an interim weapon awaiting the design of a new GPMG. It had a lighter barrel, carrying handle, stock, and bipod to make it more portable. Most M1919s had a maximum cyclic rate of fire of about 600 RPM, which while adequeate was signicantly less than that of the British Besa, or the German MG34 which like the M1919 were used as the coaxial and hull machine guns of many tanks. All three versions of the BAR were used in World War II but they were pretty similar. The later BARs included modifications to increase production and had no semi-automatic fire mode. The user could switch between a low and high rate of fully automatic fire however. These later models were also issued with a bipod and a few other things, though sometimes the bipod was removed to decrease weight. Generally the BAR was reliable, but it was heavy, and the amount of fire it could lay down was limited by the 20 round magazine and lack of a quick change barrel. In Normandy we'll have a BAR class in the spawn menu and M1919A4 (with tripod) pickup kits. As Lampshade111 correctly mentioned only from the A6 on was the M1919 equipped with a bipod and this version was only used towards the end of the war - certainly not in Normandy. I think that's a comprehensive answer. Thanks, devs.